There will be an exhibition of Liu Shaobai in Kui Yuan Gallery in Guangzhou, and I heard that there also will be Kunqu Opera performance at the opening ceremony, which intrigues me a lot because I am a fan of Kunqu. The delicately arranged mountains and waters, pavilions and terraces in Kui Yuan will also bring out the freshness, grace, elegance, and charm of the works on display. The efforts of the organizers are reminiscent of the collections of poetry and paintings of the ancients. We can't help but yearn for the prosperity of the culture in the past, and we can also outline a scene in which the literati are entertaining themselves with poetry, wine, paintings and calligraphy. Calligraphy and painting were fashionable in the literary and art circle in ancient China, they have never been isolated from the civilization even if they require highly professional accomplishment. In addition to painting techniques, ancient painters emphasized the cultural cultivation beyond the painting. Therefore, the school of "literary painting" appeared with unique characteristics. Shaobai is a literati painter who is well cultured. He has started to learn poetry and calligraphy from masters since young. He is especially famous for his paintings of landscapes and flowers, with his drastic and simple stroke, and incisive and vivid use of ink. His paintings have a style of classic elegance and timeless quietness. The rich and intense stroke and ink in the works will surely move the audience and evoke their recollection of the deeply accumulated traditional culture. Styles himself as the owner of the mountain house of Leshui, was born in February, 1983, Huang County, Shandong Province, and now lives in Beijing. 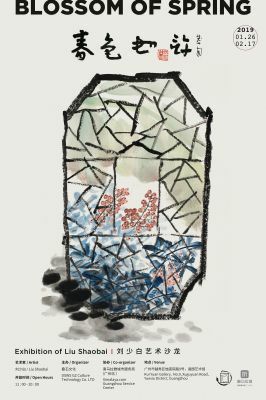 He started painting and calligraphy at an early age and was enlightened by Mr. Liang Yongzhuo and Mr. Qi Liangchi, the fourth son of Qi Baishi. He studied at the China Academy of Art and Chinese National Academy of Arts, and is currently a student of Mr. Cui Zhiqiang and Mr. Wu Yueshi. He is a member of the Jiu San Society, the Associate Researcher of the Chinese Painting Creation Institute of the Art Development Center of the Ministry of Culture, member of the Chinese Calligraphers Association, member of the Beijing Press Society, and recommended artist by Rong Bao Zhai. Liu Shaobai is a master in painting, and calligraphy and seal cutting. His works have been selected and won numerous awards for many times in the national exhibitions sponsored by the China Calligraphy Association, the China Artists Association and the Xi Ling Press Society. His works have been published in dozens of mainstream media such as "Chinese Calligraphy and Painting", "Chinese Calligraphy", "Oriental Art", "Rong Bao Zhai" and "Xi Ling Information", and have been featured in the US Blue Ocean Network and CCTV documentary channels. In 2008, his seal cutting work was carried on the Shenzhou VII spaceship in the Art Space Tour, and was collected by the state. His published collections are: "Shaobai’s Painting", "The Philosophy of Appreciating", "Remembering the Truth, Drunk among Butterflies", "Ice-like Jade Vase in Spring", "Selected Porcelain Paintings of Liu Shaobai", "Versatile", "Chinese Contemporary Painting Model - Selected Flower and Bird Paintings of Liu Shaobai", "Learning from the Past, Creating the New", "Spring on the Branch with Flowers", "Integrity, Abundance and Honour", "Rong Bao Zhai <Artworks> Journal Recommended Artists · Liu Shaobai's Album", “Years of Blessings", etc.